Yea, this is definitely something Out Of The Odinary...you don't hear news like this every day. A set of twins eloped with another set of twins. Who found who first? 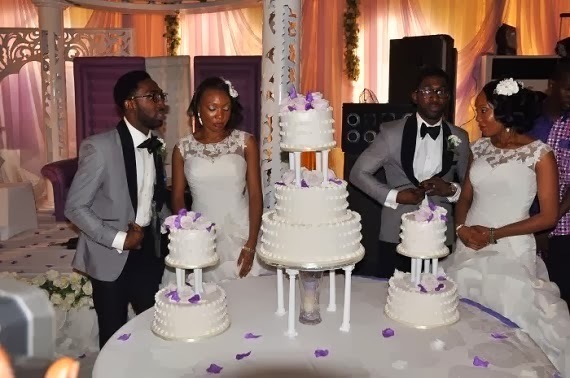 Was it that Taiye used to follow kehinde to see his girlfriend, and then he found out that Kenny's girlfriend actually had a twin sister? 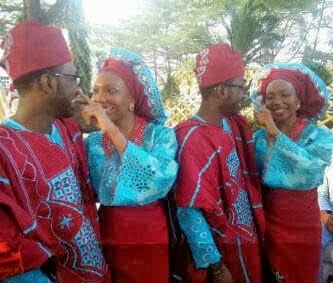 This reminds me of when me (Kayode Odusanya) and my friend Kayode Ogunnusi were asking out this set of twins back in school. I had the Taiye and my friend was chasing Kehinde. Well, we aren't twins, but were pretty much like brothers back then and went by the same first names. 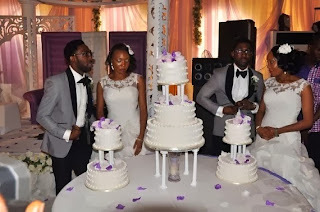 Anyway, check out the pics of the wedding day of Chinonso Akinade Okueze and Chibuzor Adelakin Okowenze, with their brides, Folawemi Taiwo Okuniyi and Febisola Kehinde Okuniyi. 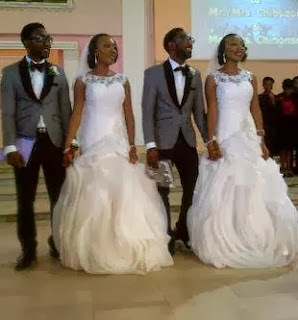 The wedding ceremony went down at Foursquare Gospel church Omole, Ikeja, last week Saturday (November 30th, 2013). What a wonderful sight.